Using the sounding export function, it is possible to export soundings in ASCII format for use in other applications. It is also useful to backup separate sounding files from a project, for instance to import them into another project or just for archiving. The ASCII import function allows you to import soundings written in ASCII format. 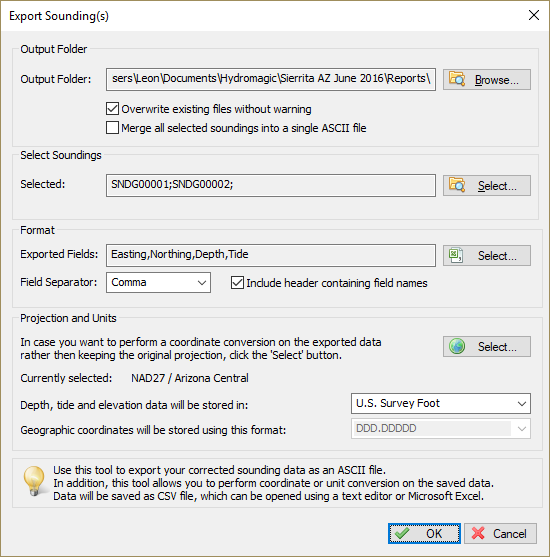 The sounding export function allows you to export your soundings in ASCII format. You can use this feature to create backups of your work, or when you want to use the data in other applications. 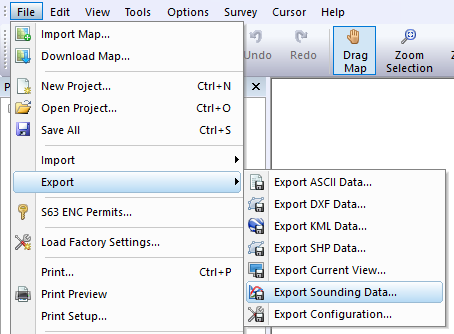 To start, open the "Export Sounding" dialog by selecting "File" => "Export" => "Export Sounding Data..." from the main menu. 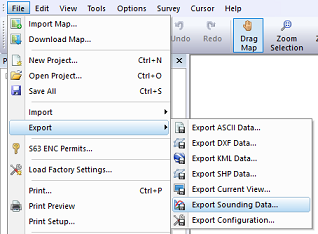 Click the "Browse..." button to select the destination folder for the data to export. All selected soundings will be stored in the same selected folder. 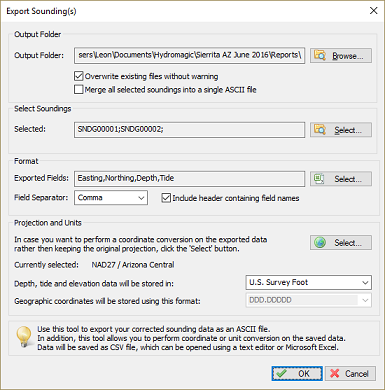 "Overwrite existing files without warning"
When this option has been enabled (checked), there will be no confirmation when you did export the soundings before to the same folder. All existing ASCII sounding data in the selected folder will be overwritten by the new data directly. "Merge all selected soundings into a single ASCII files"
By default, each sounding selected for export will be written as a separate file. When this option has been enabled, all sounding data will be merged into a single ASCII file instead. To select which soundings will be exported, click the "Select..." button in the "Select Soundings" section. 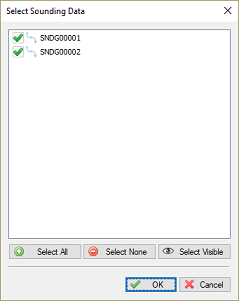 A selection dialog containing all soundings will be displayed making it easy to make a selection. 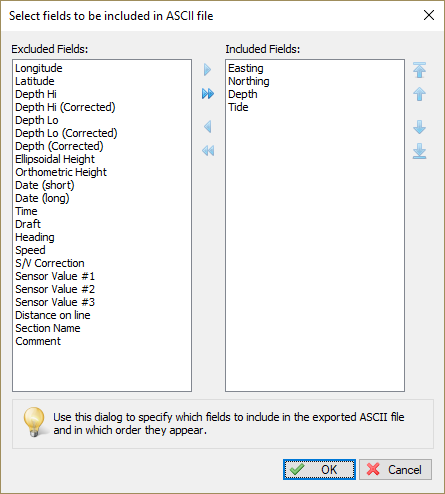 To customize the exported fields, and the field order, click the "Select..." button in the "Format" section. The following dialog will be shown allowing you to select the exported fields. Click "OK" to confirm and return to the "Export ASCII" dialog. It is possible to store the file using another coordinate reference system then the one you are currently using in your project. To change the output coordinate system, click the "Select..." button and select the coordinate system, or select the WGS84 when using geographic coordinates. In this section you can also specify in which units the depth should be written to the ASCII file. Just click "OK" to start writing the file. When all parameters were entered correctly, the exported file(s) should appear in the folder you selected.